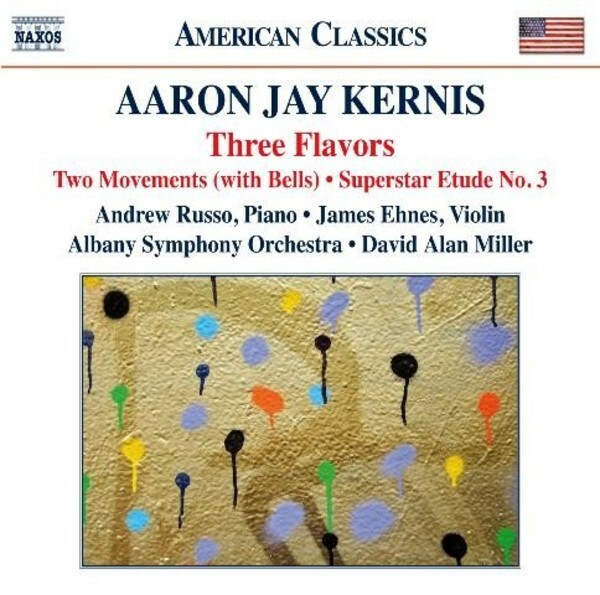 Winner of the coveted 2002 Grawemeyer Award and one of the youngest composers ever to be awarded the Pulitzer Prize, Aaron Jay Kernis is among the most distinguished musical figures of his generation. Conceived as a concerto for toy piano and orchestra, and with touches of Indonesian gamelan, French lyricism and jazz, Three Flavors appears here in its final version, adapted by soloist and long-term collaborator Andrew Russo. Commissioned for renowned violinist James Ehnes, the introspective Two Movements (with Bells) is a memorial to the composer�s father, with echoes of blues singing and improvisatory impetuousness, while the virtuoso Superstar Etude No.3 is his homage to Gershwin and the blues.